The goal of the meditation circle is to help develop mediumship abilities. Be sure to join us on every Tuesday at 7:30 p.m.
wonderful meditation and messages from Spirit. Please also see calendar for any changes or cancellations. Thank you. If it is your first time or you are relatively new to an Open Meditation Development Circle please read the following notes to help you understand better, what the circle is for, what takes place, and what is important for everyone to understand. The circle is always done around prayer and a ring of protection is asked for. Energy is asked for within the circle and this is used by the mediums or those who are developing to enable them to work. Also the healing ray is drawn into the circle and each member can take a portion of that ray. What takes place in the circle is the members who are developed or developing may come and speak to you , by giving you something they have picked up. Please don't be worried if you do not understand the message you are given, sometimes it may take time for it to unfold, and sometimes it may have been misinterpreted. Remember we are all learning and mistakes may occur. Also nothing should be opened up that will be embarrassing or too personal to you. Another important point to raise is the question of death, a true guide would never come through in a circle or even a private reading and say someone is about to die, so if you have heard stories like this in the past do not let it put you off it is more likely to be someone on a ego trip and should be treated as such. It is also an opportunity for some light meditation. People should not touch members to gain their attention as this can startle anyone who is meditating or unaware of their presence, Speaking softly and using the name of the person if known to gain their attention is the correct way. It is also wise to remember that an open circle is not the place to go into a deep meditation. Only one person should speak to give a message at one time. Try not to talk or discuss things with the person next to you , keep it until the circle has finished. It is also important not to have a open discussion in the circle as this affects the energies. It is important to ground yourself in the circle, you can do this by having both feet on the ground and imagining roots like a tree spreading from the souls of your feet into the ground. At the end of the circle, as we have been opening up we need to close down. In an open circle deep meditation can be risky and should only be done in a closed or private circle where conditions are more conductive. Please try not to have negative thoughts, remember people may be trying to pick up from you and they do not want to pick up negativity. 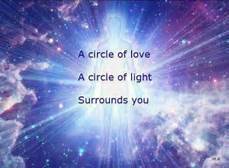 Also the center of the circle is where we should put our energy, and also draw energy from, We should not be sending or drawing energy directly from other members of the circle.